Arab nationals are avid social media users. WhatsApp tops the list of social media used by nationals across the region with two-thirds of nationals using it, compared to a marginally lower rate for Facebook and only one-half using YouTube (67% WhatsApp, 63% Facebook, 50% YouTube). Tunisians, however, prefer Facebook and YouTube (57% Facebook, 41% YouTube vs. 7% WhatsApp). Instagram, Snapchat, and Twitter form a second tier, with penetration rates between 20% and 35% (33% Instagram, 23% Snapchat, 20% Twitter). However, Twitter penetration is particularly low in Lebanon, Jordan, and Tunisia (13% Lebanon, 9% Jordan, 8% Tunisia). Facebook use is high everywhere except in Qatar and Saudi Arabia, where penetration dropped by over 20 percentage points since 2015 to 22% in Qatar and 55% in Saudi Arabia. 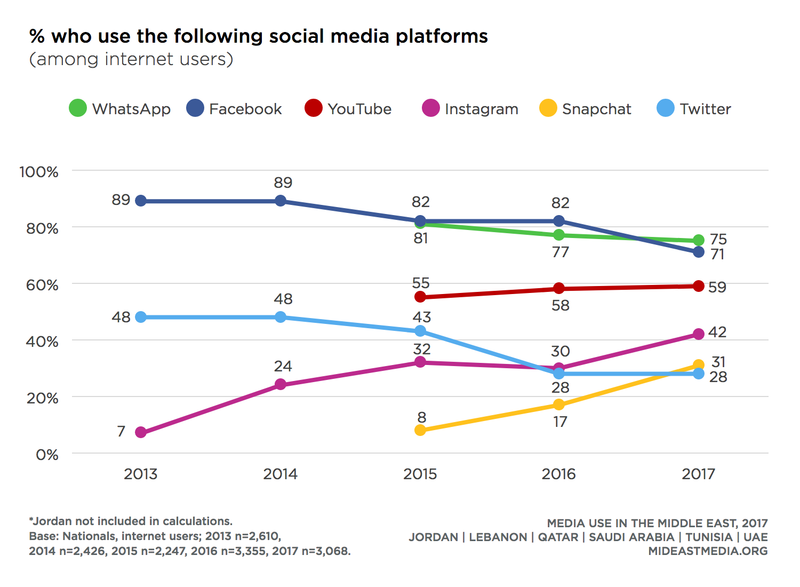 Despite general increasing social media use across the region, significant portions of Jordanians and Tunisians say they do not use any social media (20% Jordan, 30% Tunisia). Among only internet users, Facebook penetration declined by 20 percentage points since 2013 (94% in 2013 to 74% in 2017). Most internet users, 60% to 80%, use Facebook, WhatsApp, and YouTube, while one-quarter to just over one-third of internet users use Instagram, Snapchat, and Twitter (80% WhatsApp, 74% Facebook, 60% YouTube vs. 39% Instagram, 28% Snapchat, 24% Twitter). Among internet users, Facebook penetration declined across countries by at least 10 percentage points since 2015, except in Lebanon where Facebook use remains stable. Facebook penetration dropped precipitously among Qataris. WhatsApp is nearly ubiquitous, and at least two-thirds of internet users use either or both Snapchat and Instagram. 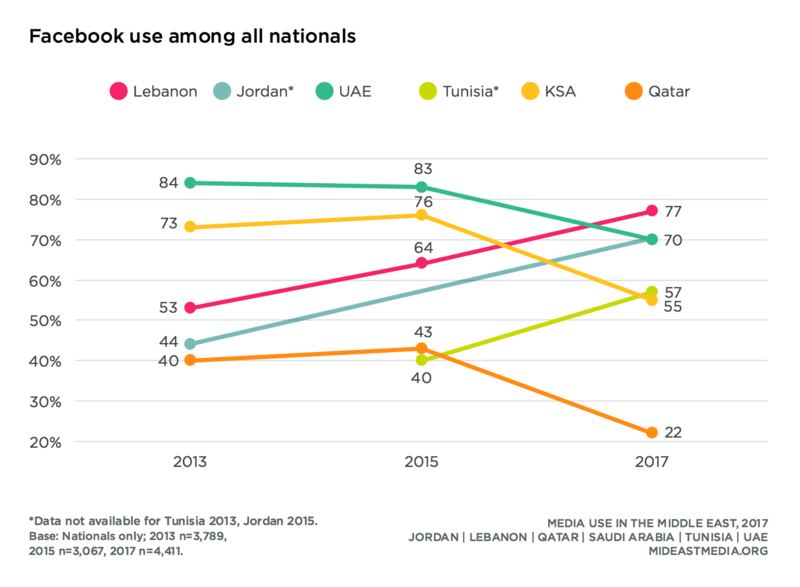 While remaining steady in Qatar and Saudi Arabia, Instagram penetration since 2015 increased in Lebanon, Tunisia, and the UAE (Lebanon: 12 percentage point increase; Tunisia: 23-points; UAE: 17-points). More than other platforms, Instagram, Snapchat, and Twitter use skew toward younger nationals (Instagram: 55% 18-24 year-olds, 38% 25-34 year-olds, 25% 35-44 year-olds, 9% 45+ year-olds; Snapchat: 41%, 28%, 16%, 5%, respectively; Twitter: 31%, 25%, 18%, 6%, respectively). WhatsApp, Facebook, and YouTube use skew younger as well, but by smaller margins because the oldest nationals (45+) are more likely to use them than other platforms (WhatsApp: 48% 45+ year-olds vs. 76% 18-24 year-olds, 74% 25-34 year-olds, 70% 35-44 year-olds; Facebook: 35% vs. 75%, 73%, 67%, respectively; YouTube: 24% vs. 65%, 60%, 49%, respectively). Nationals who worry about governments checking what they do online are more likely to use Facebook than those who are not worried, but less likely to use WhatsApp or Instagram (Facebook: 75% worried vs. 66% not worried; WhatsApp: 71% worried vs. 79% not worried; Instagram: 34% worried vs. 42% not worried). Snapchat, Instagram, and YouTube are used more often for entertainment purposes than for news. 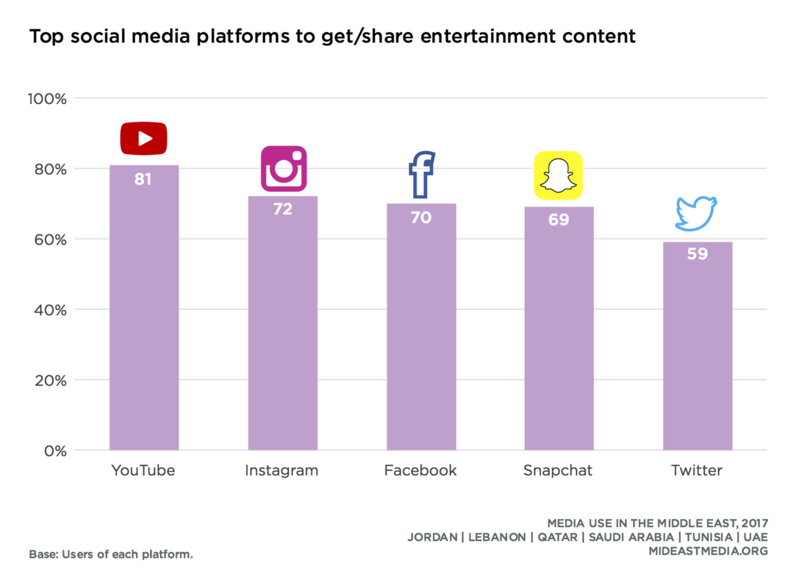 Among platform users, at least seven in 10 use Snapchat, Instagram, and YouTube to get or share entertainment, while only half or less use these platforms to get or share news content (Snapchat: 69% entertainment vs. 41% news; Instagram: 72% entertainment vs. 46% news; YouTube: 81% entertainment vs. 56% news). Twitter is used more than any other platform to get and share news, followed by Facebook (77% Twitter, 71% Facebook vs. 56% YouTube, 46% WhatsApp, 46% Instagram, 41% Snapchat). However, six in 10 also use Twitter to get and share entertainment content (59%). Most nationals use WhatsApp but primarily for communicating with others rather than for getting or sharing news or entertainment content (96% communication vs. 46% news, 51% entertainment). Facebook is used by nationals at a high rate for all purposes: 89% communication, 71% news, and 70% entertainment. Nearly eight in 10 Twitter users use the service for news regardless of their age (72% 18-24 year-olds, 78% 25-34 year-olds, 83% 35-44 year-olds, 81% 45+ year-olds). The same is true for entertainment consumption on YouTube across age groups (81% 18-24 year-olds, 82% 25-34 year-olds, 81% year-olds, 78% 45+ year-olds). Three-quarters or more of all nationals use social media to interact with others: 80% see what friends are family are doing, 76% post messages/comments via messaging, 82% get messages via messaging, 76% post messages/comments via social media, 77% get messages via social media, 77% post/share their own multimedia content, 77% re-post/share others’ links or content. These same activities are performed by about 50% to 70% of all nationals on a daily basis (64% see what friends are family are doing, 54% post messages/comments via messaging, 70% get messages via messaging, 53% post messages/comments via social media, 62% get messages via social media, 48% post/share their own multimedia content, 47% re-post/share others’ links or content). Among internet users, these rates jump to nine in 10 doing these activities at all and between one-half and three-quarters doing them every day (do daily: 76% see what friends and family are doing, 64% post messages/comments via messaging, 84% get messages via messaging, 64% post messages or comments via social media, 75% get messages via social media, 57% post/share their own multimedia content, 56% re-post/share others’ links or content). The similarities in online activity across countries are more striking than the differences with only a few exceptions. A greater proportion of internet users in Saudi Arabia and Tunisia share their own or re-post others’ content on a daily basis, while less do so in Qatar (post own multimedia content daily: 68% Tunisia, 65% KSA vs. 41% Qatar; re-post/share others’ content daily: 71% Tunisia, 66% KSA vs. 36% Qatar). Younger internet users engage in a wide variety of social media activities on a daily basis at much higher rates than their oldest counterparts (45+). The only exception is checking what family and friends are doing on a daily basis, which all age groups do in roughly equal proportions (77% 18-24 year-olds, 77% 25-34 year-olds, 76% 35-44 year-olds, 72% 45+ year-olds). Older internet users are least likely to post or get messages or to post or share their own multimedia content on social media on a daily basis (post messages: 46% 45+ year-olds vs. 70% 18-24 year-olds, 69% 25-34 year-olds, 61% 35-44 year-olds; get messages: 61% vs. 82%, 77%, 71%, respectively; post or share their own multimedia content: 43% vs. 65%, 59%, 53%, respectively). In terms of what content people share online, no specific type of content stands out. In a given month, 20% or fewer share about film, TV, fashion, or advertising. 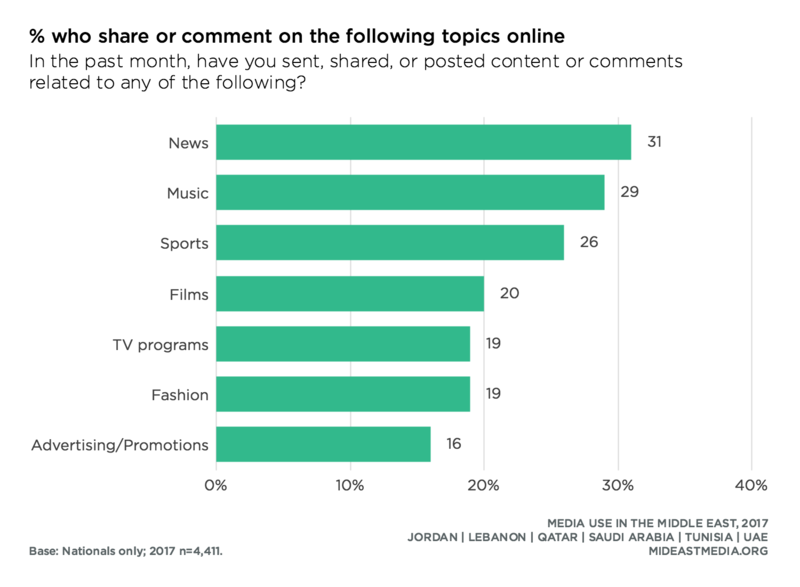 However, sports, news, and music are more broadly shared and at similar rates (26% sports, 29% music, 30% news/current events). Large majorities of nationals in Saudi Arabia, the UAE, and Lebanon have shared at least some content online in past month, compared with six in 10 in Qatar, Jordan, and Lebanon (92% KSA, 89% UAE, 80% Lebanon vs. 64% Qatar, 60% Jordan, 60% Tunisia). Overall, Saudis are most likely to share online about all of the topics presented. Social media and direct messaging have become go-to sources for news and information. Eight in 10 nationals get at least some news via these online channels, and two-thirds turn to these sources for news every day (at all: 79% social media, 82% direct messaging; daily: 66% social media, 68% direct messaging). 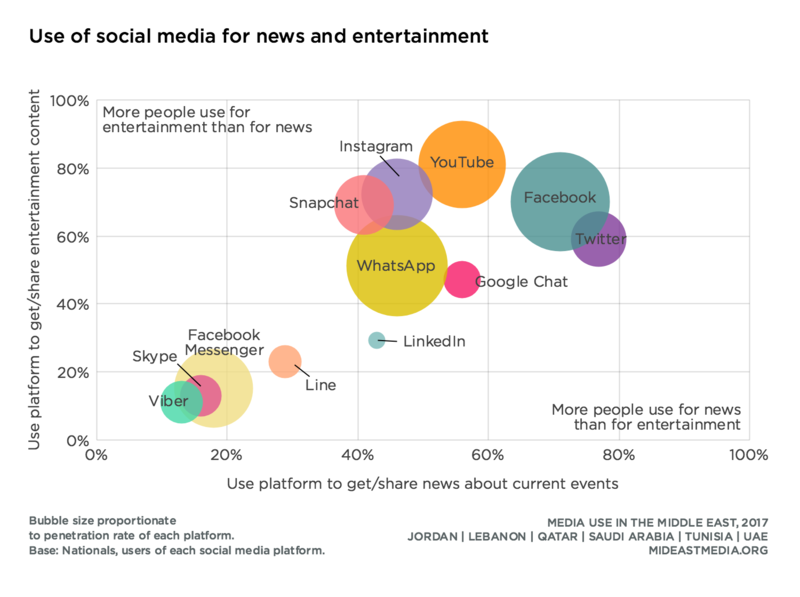 Emiratis and Qataris are the most likely to turn to direct messages for news daily (87% UAE, 80% Qatar); Emiratis and Saudis are the most like to choose social media for daily news (83% UAE, 76% KSA). Social media and direct messaging are both deemed important sources for news and information—seven in 10 agree—but still at a lower rate than for TV (83% TV vs. 70% social media, 69% instant/direct messaging). Qatar and the UAE are the only two countries where all three news sources are rated as important by similar proportions of nationals. 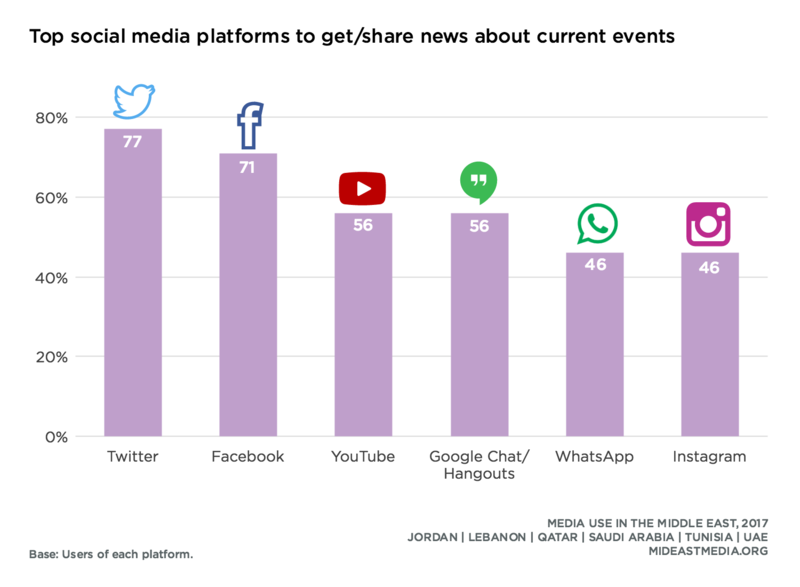 Since 2015, the portion of nationals finding social media and direct messaging as important news sources increased significantly in Lebanon, Tunisia, and the UAE, by up to 20 percentage points (Lebanon: 14 percentage point increase for social media, 12-points for direct messaging; Tunisia: 16-points for social media, 20-points for direct messaging; UAE: 7-points for social media, 11-points for direct messaging). Despite broad use of social media for news and information and the broad support for it as an important source, trusting news from social media is less certain. Less than half say they trust news on social media and one-third do not trust this news (47% great deal/fair amount of trust vs. 32% not very much/no trust at all). 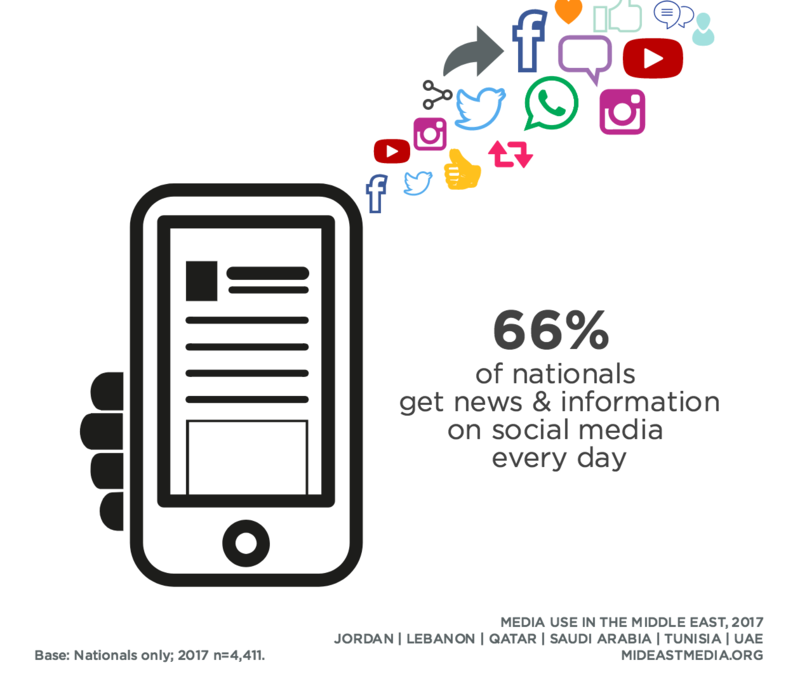 Nationals from Lebanon, Saudi Arabia, and the UAE are more likely to trust social media news than those from other countries (58% Lebanon, 56% KSA, 56% UAE vs. 40% Jordan, 36% Tunisia, 35% Qatar). The broadest trust among nationals for complete, accurate, and fair news coverage is for both mass media in general and for mass media in their own country—two-thirds trust these sources—while about half trust other mass media in the Arab world, media from Western countries, or social media (66% trust mass media in general, 66% mass media in their own country vs. 52% mass media in the Arab world outside their country, 49% mass media in Western countries, 47% social media). Arab Nationals who trust mass media in general are also more trusting of news on social media—at a rate of two to one over those who do not trust the mass media (trust news on social media: 59% trust general mass media vs. 24% do not trust). Nationals worried about governments checking their online activity are less likely to trust mass media news than those who are not worried, but more likely to trust news from social media (trust mass media: 66% worried vs. 71% not worried; trust social media news: 54% worried vs. 48% not worried). The proportion of direct messaging (DM) with groups compared to individuals shifted dramatically since 2015. Currently, half of direct messages sent and received are in group chats and half are between individuals. This represents a significant increase in group messaging—an increase of 15 to 42 percentage points in all countries except Qatar. 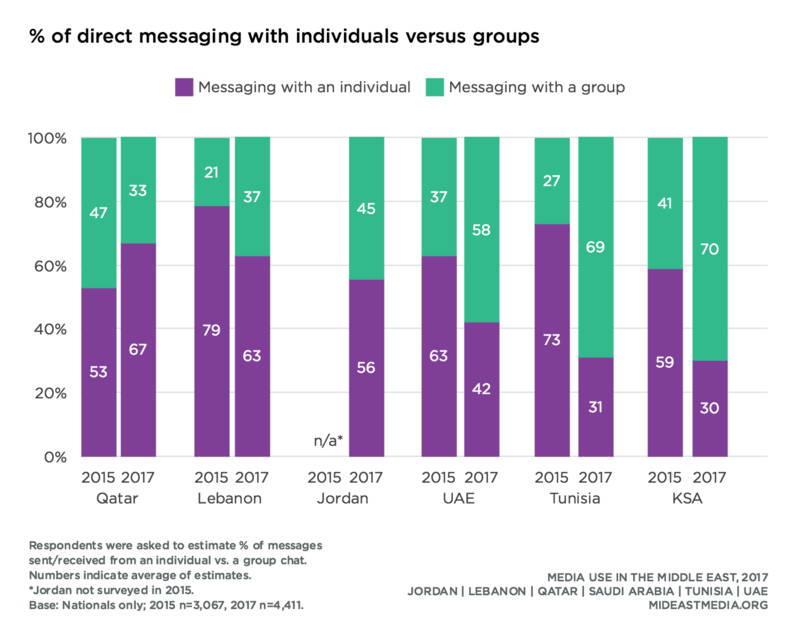 Qatar is the only country where group messaging decreased since 2015 (by 14 percentage points) to one-third of all direct messaging. 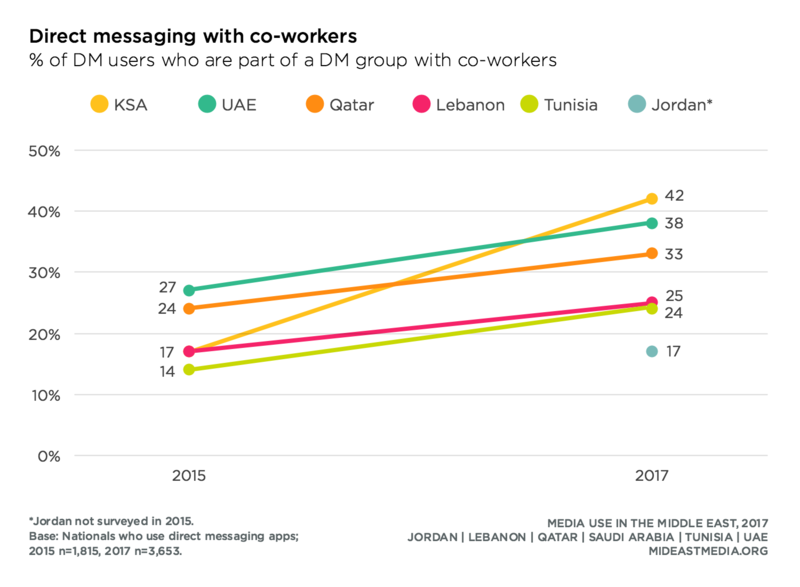 The majority of direct messaging is with groups in Saudi Arabia, Tunisia, and the UAE (70% KSA, 69% Tunisia, 58% UAE vs. 45% Jordan, 37% Lebanon, 33% Qatar). 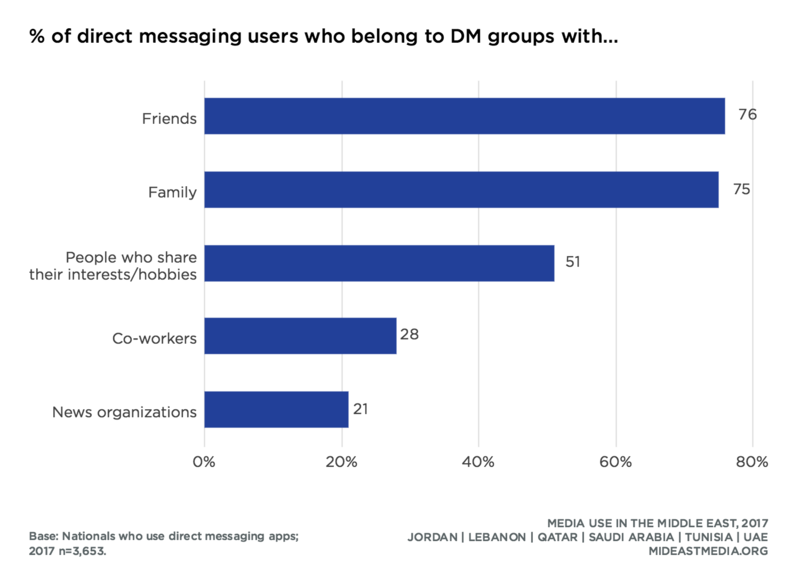 Friends and family are the most popular DM groups. Three-quarters of nationals belong to a friend or family DM group and one-half belong to a DM group with people sharing similar interests and hobbies. Co-worker and news organization groups are less popular (28% co-workers, 21% news organizations). Family and friend groups are popular in all countries, but Saudis, Emiratis, and Tunisians are far more likely to participate in DM groups with people sharing common interests and hobbies (75% KSA, 69% UAE, 55% Tunisia vs. 40% Jordan, 39% Lebanon, 29% Qatar). While co-worker groups are not very popular among DM users as a whole, they are popular among employed individuals. Over six in 10 employed individuals belong to a co-worker group, ranging from half in Lebanon, Jordan, and Tunisia to nine in 10 in Saudi Arabia (63% regional average, 52% Lebanon, 54% Jordan, 55% Tunisia, 60% Qatar, 73% UAE, 91% KSA). Nationals are most likely to share personal information in DM groups, including both social/personal information and personal photos and videos. 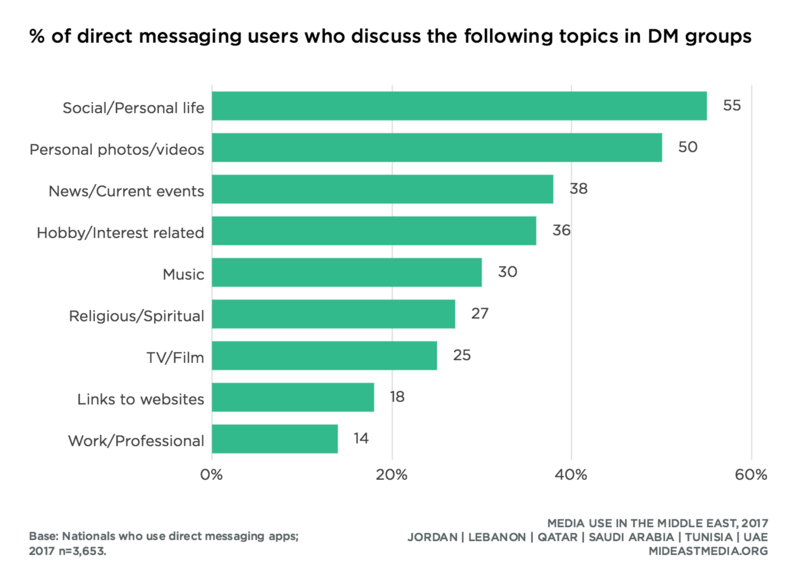 About half of direct message users share this type of information (55% social/personal life, 50% personal photos/videos). Only one-quarter share information about religion, TV, or films in group chats. However, one-third of DM users share about news and current events, their hobbies and interests, or about music in group chats (38% news/current events, 36% hobbies/interests, 30% music). As with most social media activities, the oldest cohort (45+) is less likely than younger nationals to share about most topics in DM groups, with two notable exceptions. 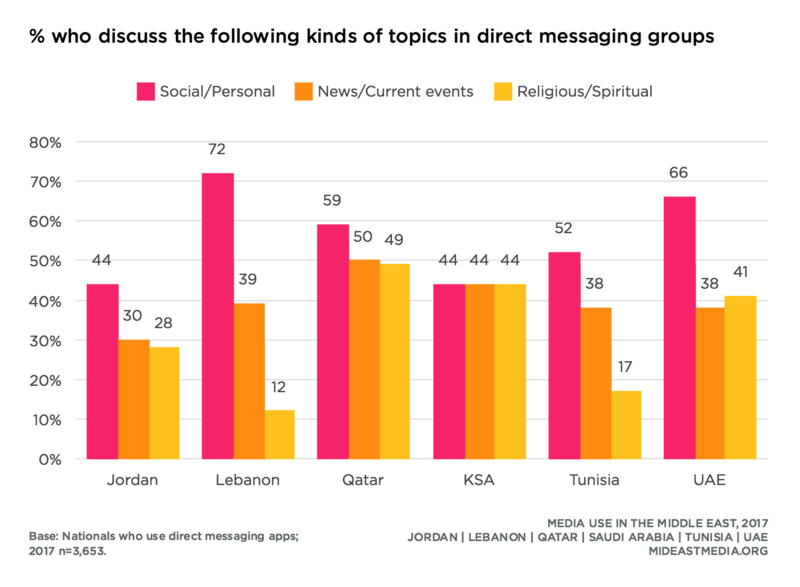 Among direct message users, all age groups share religious content and news and current events at similar rates (religious content: 24% 18-24 year-olds, 29% 25-34 year-olds, 28% 35-44 year-olds, 26% 45+ year-olds; news/current events: 37%, 41%, 43%, 33%, respectively).